How does one talk about a movie that wants to be nothing more than just "okay"? How does one review a movie whose only purpose is to be a palette cleanser between a previous and upcoming franchise high? How does one discuss a project that shot out all its best ideas in part one and is running on fumes the second time around? Is there any genuine merit in spending 4 minutes of your life reading about a movie that aspires for mediocrity and is wholly content with it? Well, we spent 120 minutes watching it, so we are hoping you have 4 minutes to spare. Ant-Man And The Wasp comes on the heels of the MCU's three greatest triumphs: Thor: Ragnarok, Black Panther and the incomparable Avengers: Infinity War. To its credit, the second day out in the sun of Ant-Man (Paul Rudd) keeps itself away from a plot that involves its main characters saving the world. 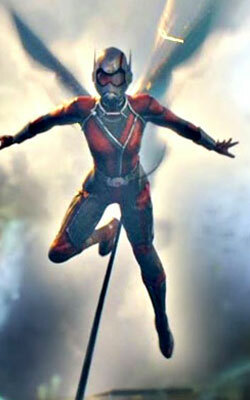 Instead, Hank Pym (Michael Douglas), Hope Van Dyne (Evangeline Lilly) and the title character are busy at work trying to bring back the original Wasp, Janet Van Dyne (Michelle Pfeiffer), from the quantum realm. There are bad guys (Walton Goggins' Sonny Birch), anti-heroes (Hannah John-Kamen's Ghost) and government-appointed good guys (the FBI) who attempt to stop our heroes from achieving their goals. Cue the rehashed jokes, tedious family dynamics, uninspired romance, a decent number of sight gags and a plot that feels like its whole purpose could have been achieved by editing it down into a few post-credit scenes behind some of the better movies to come out of the MCU's ever-growing cannon. 2015's Ant-Man was by no means a ground-breaking movie. It was a paint-by-numbers origin story whose sole purpose was to introduce a new character that would be a part of a larger connected universe. It's only hooks were the charming presence of Paul Rudd and the conceit of shrinking a man to a size smaller than that of an ant or ballooning him to the size of a skyscraper. It is three years later and all we are served is a reheated version of the same dish with the addition of a Wasp in our soup and a ghost inhabiting the kitchen. Ant-Man And The Wasp exists merely to lap up the goodwill left behind by its predecessors, and beingh careful not to rock the boat it is on in the process. It is safe, nice and marketable to all the kids enjoying the final days of summer. The movie is reminiscent of that one friend we all had in college who always dressed well and spoke eloquently without saying anything of real substance or, heck, even genuine idiocy. You never feel a sense of exuberance or exasperation with this Iron Man 2 of a sequel, and therein lies the downside to being inoffensive and towing the company line to a tee. The movie is no longer a piece of expression - it is just the new Ford Figo coming off the assembly line. The overlords at Marvel Towers cast their primary characters with some talented performers without whose presence the returns the movie offers its audiences for their time invested would be as minuscule as the movie's heroes. The actors trudge through weak writing and undercooked plotting in the faint hope of giving their viewers a good time at the cinema, and to their credit they succeed in parts. 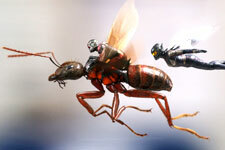 Their performances are akin to the close-up magic tricks Scott Lang uses to entertain his young daughter. We are looking to be fooled by the misdirection of the affable lead trio and the brand familiarity that the MCU creates so as to not focus on the mediocre moviemaking at play hidden behind those smiles. Barring the visual effects, the film offers nothing fresh in terms of visual storytelling. In a strange turn of events, the movie undermines the effort its onscreen talents are putting in by employing uncharacteristic edits and scene transitions. Every line of repartee is chopped off a millisecond too early which actively makes the film's emotional stakes ring that much hollower. The music running through the movie is just what you would expect as well. It hits the highs, scratches the lows, and is science-y sounding when it needs to. While we understand excellence is not an everyday occurrence, aspiring for it should be. And that is exactly why we ask, how long it would take for the memories of this film to erode from your mind. We'd bet that it would be sooner rather than later. Be the first to comment on Ant-Man And The Wasp! Just use the simple form below. fullhyd.com has 700,000+ monthly visits. Tell Hyderabad what you feel about Ant-Man And The Wasp!